Welcome to Day 1, if you are just arriving for the first time all the details and the linkup can be found HERE. 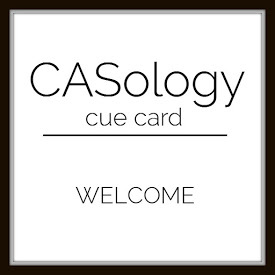 I am pleased to announce that CAS-ual Fridays and some of their Design Team is joining me today! They are offering a $25 gift certificate for the CAS-ual Fridays store. Oh my! Day 1 and already my festive spirit is soaring! You and the CASual Friday gals have designed gorgeous tags! Hard to narrow down a 'single' thing that inspired me, dazzled as I am by everything, but here it is: the size of the tags. You've all shown that tags don't have to be "big" or ornate to be impressive! Love the 'little' works of art with mega impact! Such a great way to start this challenge. My mind is already racing with ideas. I love the ornament shakers, but I also like the sweet mistletoe tag and Santa's sleigh. Last but not least, I love your own tag, Tracey. The white looks so crisp on the red tag, and I'm itching to ink up the snowflake stamps you've used. First off, thank you so much for having this tag project! I look forward to it every year. My favorite tag today is yours; I love the look of red and white. I am definitely inspired by traditional Christmas colors and icons featured in today's post. Thanks for another 25 Days of Christmas Tags event!! Hi Tracey! Thanks again for hosting such a fun event for everyone! Love how your red and white tag looks exactly like a Christmas sweater, especially with all the white dots you added. Just like it was knitted!! Beautiful tags today! I am most inspired by just how gorgeous the bold, graphic, and clean tags are! Sometimes it feels like we have to really load the tags up with stuff to be pretty and each of these tags are just beautiful! 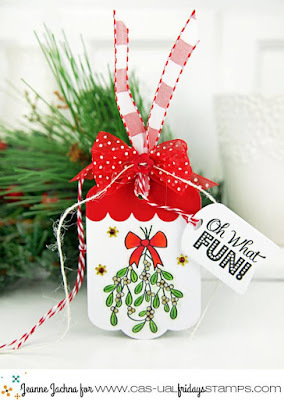 I love Tracey's red and white snowflake tag - -it really feels cheerful! Hola Tracey, your tag is beautiful, thanks for this merry and wonderful party!!!!! I love the idea of creating tags because for some reason they seem more do-able in a time crunch. I don't have a lot of time these days to create it seems (or feels). Who isn't happy for more tags when gift wrapping time comes around?! "Not I, she said!" Gosh what a fabulous collection and already I can't decide between the last two as to which is my favourite!!!! Starting off with a bang for your Day 1 post! I love Vicki's shaker tag... inspired to make a shaker card or tag after looking at the cute details! 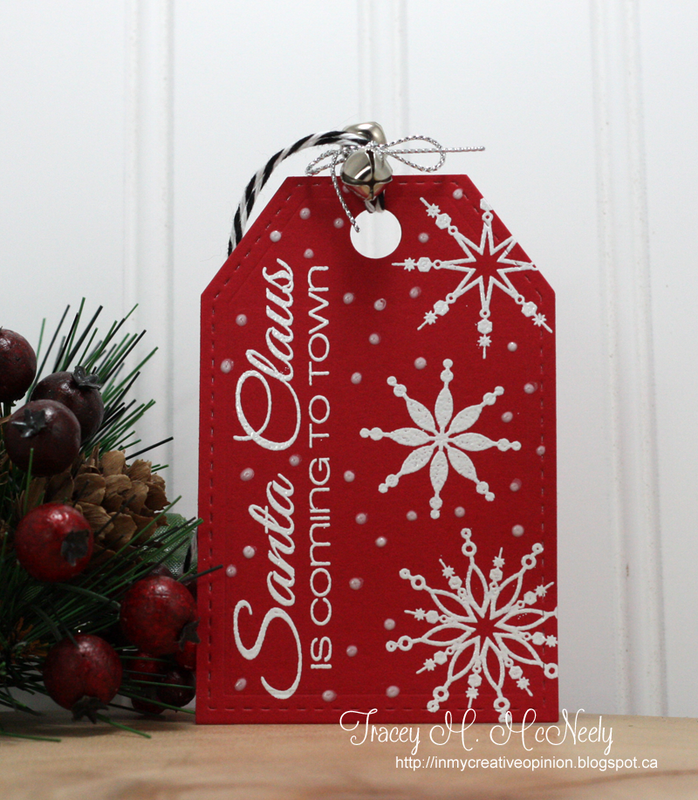 Also love the red and white combo on your pretty tag, Tracey! Inspired to cut some snowflakes from several dies I have! Wonderful tags. I think I am inspired to make a shaker tag. Oh Tracey! I love your clean red and white tag - absolutely gorgeous - the delicate snowflakes are crisp and clean.. and I love the little white dots you added to make it SNOW! Thanks for putting this event together - lots of work for you but I look forward to seeing it every year! All wonderful tags but I'm inspired to try making a shaker tag. Oh wow! Great start!!! All these tags are amazing but I will definitely to try making a shaker tag or card!!! Really beautiful!!! What gorgeous tags! I love that last one, bold red with stark white fine details. So excited for this again this year! 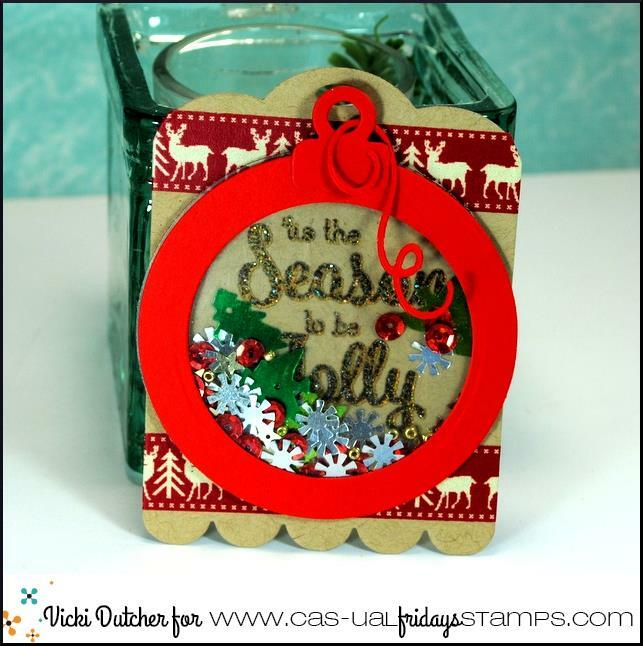 Jeanne's tag really inspired me since I recently got that stamp set from CAS-ual Fridays. I am going to work on my tag tonight. 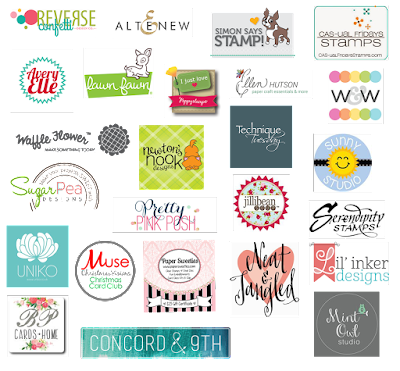 Fabulous tags, and your card is such an inventive take on the cue work! Brilliant. LOve the simple white on red tag! I love tags and am looking forward to all of the wonderful inspiration. Today's ideas are great. Especially love Vicki's shaker. I don't make a lot of tags, but I so enjoyed your Tag event last year I've been looking forward to November & here it is! Fun tags to start--love the idea of a shaker tag--gotta try that! 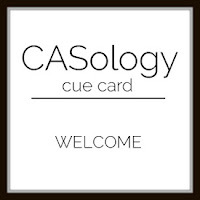 Your CASology tag is beautiful, but I have to admit I had to look twice to get how it applied to the cue word & then I shouted out loud--brilliant, Tracey! OK, I am in the holiday mood! All these wonderful tags make me want to get crafty! Kelly's sleigh reminds me of my father's ranch. We had a red sleigh out in front every Christmas! My favorite time of year! Tracey's tags! Seeing all the wonderful tags inspires me to get busy making my own. My favorite time of year! Tracey's tags! Seeing all the fabulous tags inspires me to get busy to make my own! Oh Tracey!! Thank you so much for hosting this. It was so fun to be able to play!! I LOVE your red and white snowflake tag. The addition of the little bell is perfect! I can't believe it's tag time already!! Looking forward to seeing all the gorgeousness over the next 25 days especially after today's awesome start! These are all delightful tags!! I adore you white on red stamping Tracey, is so pretty!! They are so nice, it makes it hard to decide. These are all so fab, but your red and white tag is radiant, Tracey! Just seamless with the beautiful sentiment and snowflakes! I am inspired by the festive holiday colors! I love the striped ribbons, the shaker cards, the sleigh and the snowflakes. Making Christmas tags is such a fun project as it goes quickly and it makes your gifts so pretty. It provides a special touch that they are handmade! Thanks for the great ideas! Wow!Love all these tags! And what a great way to get ready for the season when the pressure is still not ON! I am particularly drawn to the white snowflakes on your red tag, Tracy. Just beautiful! Definitely all the stamps used in here inspired me today, and your tag is so wonderful, I so want to CASE it, I might and link up Tracey! Fabulous tag....love the red with the white ink! Love the way that your tag has the sentiment vertical!!!! LOVE that effect and it usually not remembered by me to use! LLLLLOOOOOOOOOOOVEEEE the snowflakes!!!! Tracey thanks for holding this wonderful event each year! I too love your crisp red and white tag! It's gorgeous! And all of the amazing tags from the Casual Fridays team are so inspiring too! I am so inspired to create! So many beautiful tags to kick off the fun. I love the Santa Claus is Coming to Town tag because the white contrasted against the red is fabulous--the snowflakes pop off the tag. Yahoooo for Day 1 and CAS-ual Fridays! Love everyone's sweet tags! Tracey, yours reminds me of a comfy sweater...love how the white pops! These are incredible!!! Love how each one is different and all are beautiful! 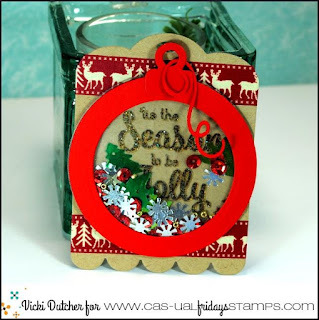 Inspired by every tag ... wishing I had a bit of Casual Friday's pretty Christmas products! Gorgeous collections of tags!! Love your merry and bright tag with all the white against the red, Tracey! What a fun event! Thank you for hosting!! Wow! So inspiring and delightful creations for Day one! Love your tag in rich red with beautiful stamping and font of the sentiment! Love the red with the snowflakes. I was really inspired by how simple yet elegant your red & white tag was Tracey! And all the photos are stages so beautifully too! Love them all! Those shaker tags inspire me to make more fun tags instead of just flat :) THANK YOU so much for the inspirations today. Super awesome all of them! I must join this fun. Note to self "Don't procrastinate!" What a fun tag, Tracey! Love how crisp and clean the red and white is. I'm so happy to have been able to join in the 25 Days of Christmas Tags with CFS this year! Your tag is most inspiring today. Just love the red and white. I love getting ideas for tags! The shaker tags are my favorite and the jingle bells are a cute touch. Thanks for all your hard work putting this together. 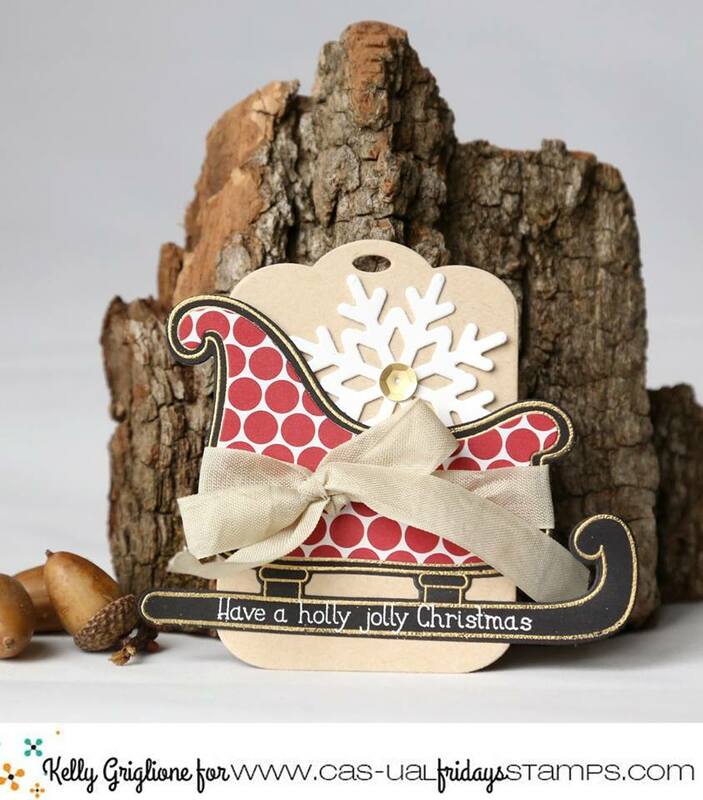 All these wonderful holiday tags is getting in me in the mood for Christmas! Love the little shaker tags! So many festive tags! I think the inspiration is that tags can be simple and stunning like the red tag with white embossing. so festive and gorgeous tags, wow, I love the red one. They are all fabulous.Especially like the cute red and green one by Jeanne Jachna. What lovely tags to start off with! I'm inspired by all the wonderful holiday red!! So excited to see shaker tags! Never would have thought to do that. Can't wait to play along. Yippee! The shaker tags are super fun, and I really like that Santa's sleigh. wow what a great way to start your 25 days of tags. These tags today were fabulous. Love the snowflake and shaker tag. 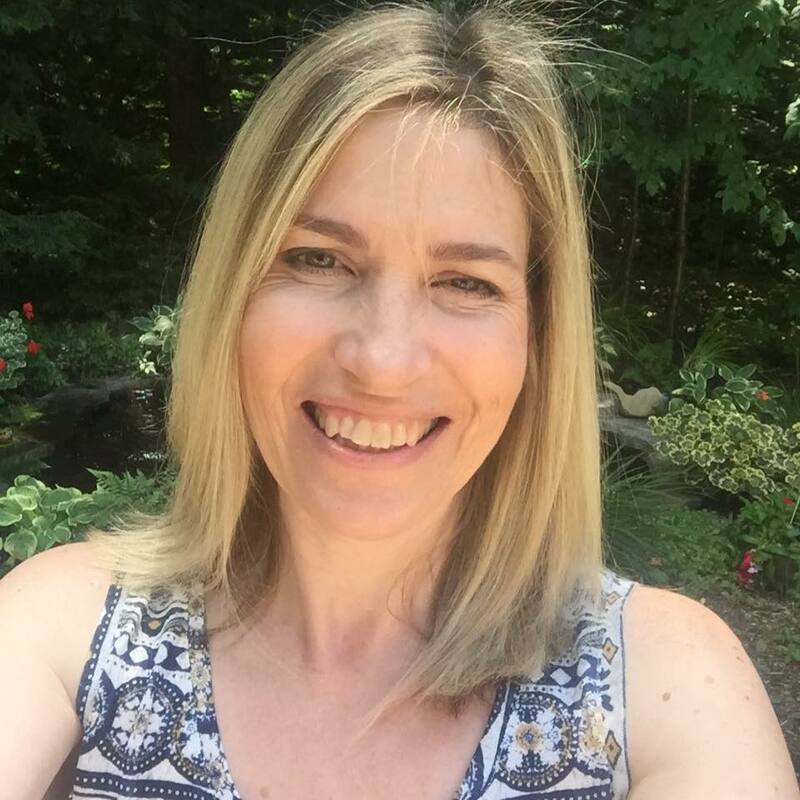 Hi Tracey, I was looking back at all of the blog posts so far since day one and I can't believe I forgot to comment!! 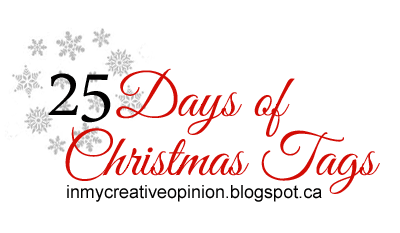 I remember trying a few tags last year which was the first time I became aware of your Christmas Tag Challenge. I haven't been making cards that long, but I have finally gotten a better rhythm and am able to make more tags this fall because most of my Christmas cards are completed for the year, including a bunch for card drives. I am loving all the different tags and getting lots of inspiration. Thanks for organizing this! I love your tag Tracey!! Super pretty, the white on red. I like shaker cards so why not shaker tags. Love them. A great start to this event. Beautiful tags!! Love the shakers! Thanks for all the inspiration!! OH I'm so far behind, I was out of town and just started following the tags. So glad you are doing this again this year. Beautiful tags! I'm inspired by that shaker tag, so clever, I think I need to make some little shakers like that. Thanks for sharing all of them, they are wonderful. So much inspirations - such fun tags! Every one of these tags on the hop are so beautiful, and all unique. I love the shaker tags, especially the one by Nora, for the added fun of an interactive element. What great tags! I love,love, love Tracey's crisp red and white tag! I feel inspired to make some shaker tags; so cute! I love the cute simple mess of the no peeking tag. All are wonderful today! What a great event ! I love your red tag with its white embossing ! And I love the sentiment (now I have the song in my head for the rest of the day !). Thanks for sharing. Beautiful Tags.. So much of inspiration..
Great tags love the embossed snowflakes so pretty against the red background. I am intending to wrap all my gifts in Kraft paper this year so I locked in on Kelly's wonderful tag. I got here late and have spent the day going backwards through these posts... so much inspiration! Thanks for all your hard work in putting this together! I'm loving the round shakers on this post with just a sentiment on the inside... simple elegance! Day 1 tags are so merry and bright, and I love the traditional red and green on these tags! I'm inspired to pick my favorite bright red and green and make some tags. 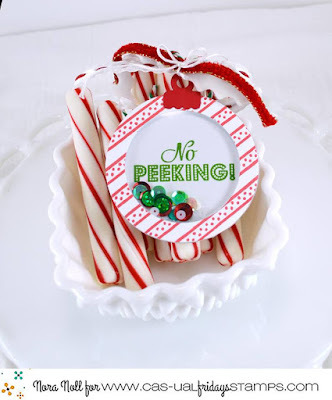 I'm inspired By the chevron and No Peeking tag! My sister was a snoop. For all I know she still is. This one is great! Wondferful classy collection - I can't choose a fave! Nothing beats the red tag with the white embossed snow flakes Tracey. Its your tag hands down. Oh these tags are so inspiring! Oh these are all so festive! LOVE the variety of shapes colours and designs!!! I love the simplicity of the white on red tag. I LOVE the OH what fun tag! Beautiful tag Tracey! Love the white embossing on the red... very striking!! Yay..... fabulous tag making inspiration abounds! !